Our lives are filled to the max with stuff: iPhone® 4 (and we can’t wait for a 5G model), 60-inch LCD flat-screen televisions (though now we need the 3-D version), numerous sports lessons to which we drag our children (you know, because they’re going to be future NBA/NFL stars), seventy-hour workweeks, Facebook accounts, Twitter accounts, blogs. No matter what and how much we have, and no matter how many things we try to add into our day, it’s never enough. We have more than the previous generation could ever imagine, so why are our lives flooded with devastating amounts of stress, anxiety, depression, and loneliness? And what can we do to change this constant, never-ending search for fulfillment? In this breakthrough book, McClanahan argues that designing your extraordinary life doesn’t require a MBA and can’t be found with an iPhone app. He believes we already know exactly what to do. Unfortunately, we struggle to focus on what’s important because we are always searching for a quick fix to the challenge of the day. 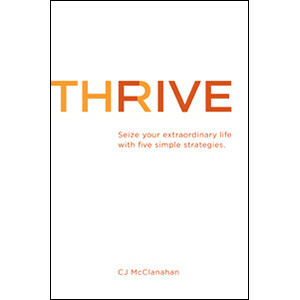 The good news is that anyone can live their extraordinary life by focusing on McClanahan’s five simple strategies. These tactics are simple, straightforward, and apply to everyone from CEOs or retired teachers to stay-at-home moms or high school students. However, there is a catch. While these strategies are simple, they can be difficult to implement. Minutes after completing any book, we instanly allow our minds to drift and forget what we have just read. (Think of all of the self-help books that you’ve read. Now think of the ones that actually changed your life.) That’s why McClanahan provides clear guidance for ensuring that you stay focused on these strategies so you can actually change your life.